Vive les black-blanc-beur! It was great to watch France win the World Cup today, I only wish I had been back in the Goutte d'Or to celebrate with everyone there. Several of France's great young players reflect the country's complicated colonial history that is embedded in that neighborhood, though perhaps none so much as Kylian Mbappé. With a father from Cameroon and a mother from Algeria, he is especially emblematic of the immigrant neighborhood and nearby suburbs (where he grew up), where a promising new France still struggles in a time of rampant anti-immigrant fervor. I remember especially my interview with The Bachelor, as he calls himself, a sapeur who owns a men's store in the Goutte d'Or (aka Barbès or Chateau Rouge) where he sells the fashions of la sape. Of all the Parisians who participated in Cocoon, he may have explained the spirit and possibility of neighborhood most evocatively. "I’m one of the defenders of my culture [as a sapeur], my life is a witness to it. I’m a life history that speaks. But if I’m a part of my history at most, what do I matter? What’s the point of my life? "You have lived the culture you inherited from your parents. It’s the same for me. I’ve been in France for 36 years, but I’m from somewhere in a certain African country. If you’re in my store, the things are pretty much classic to have on the shelves, you see, but they wouldn’t have anything to do with what’s in other stores. It’s not provocation, but it’s a reflection. I’m always displaying my African culture for the world. You can dress yourself differently in order to express your culture and make yourself happy, by wearing something a bit crazy, but which isn’t that crazy at all. "When I see people, like you, who come and give us the chance to say what we have to say, in my opinion, you are my ally—since you let me express myself, convey something about what immigrants are doing in Paris. There are negative associations, you see, with people from elsewhere. "Today, I left my store and I came here because, in your own way, you are participating in a certain cultural exchange, a supposition of humanity. Because what’s humanity? you have people talk to each other—from several cultures in Paris. "Because Château Rouge has become a certain new France. It’s a certain Africa, a certain Asia, a certain Latin America. You see? This project is in the center of a certain dialogue. That’s what is so great. All stories are welcome. Without them, these different cultures are left behind." Taj and me discussing interview techniques. Delicious and I mean delicious Fried Fish & Fries at the Tenant's Community Room. Russell cooked up an amazing dinner with homemade mac&cheese and rice sides. And fresh fruit. We interviewed people about memories in the neighborhood. about how it use to be running basketball tournaments in the Jacksons all day long, all summer long : little kids, teens and adults. about showing love and giving back to the community. Taj Collins has been working on Cocoon as a Field Organizer since Spring 2016. Like Jewels, he has now taken on the job of interviewing people along with me. So much fun and such good interviews. Another great day at MARs. Thanks Ilana for the photos. Jewels Marshall (Cocoon Field Organizer since Spring 2016) recording memories at Morrisania Air Rights Family Day. The group is standing in front of the map of the neighborhood that we all created this winter in the MARs community space - (thanks especially to artist Alejo Salgado for drawing the map). Some of Eric Etheridge's portraits of local people are along the side of the map. I love this photo of Chaney Yelverton (Morrisania Air Rights tenant association president) and his daughter with Council Woman Vanessa Gibson. Great Day in the neighborhood. In 2011, Kathy Ortiz-Herscher (then assistant principal at IS 151) invited me to collaborate with 150 of her students on a artwork. I was between major projects and wanted to work near to home and specifically in the Bronx with a close community. We worked with the students for 6 plus months gathering materials around Morrisania Air Rights, Melrose and Jackson houses, making symbolic objects, recording stories and Eric taking portraits. We did everything but build the Cocoon -- although the students had lots of suggestions about where and where not to build it. If any of you have ever worked in the public school system you can imagine the incredible organization and heart it took on the part of Ms. Ortiz-Herscher to make this happen for her students -- in addition to the 24-7 work she was already doing at the IS 151 (a school that was at that time threatened with closure). The students, teachers and Kathy rocked my world. This work called, Little Cocoons for the South Bronx, was exhibited in the community space at Bronx Arts Museum. It was a way for students to come to the museum with family and experience the work -- to hear their own voices in a separate museum world. Kathy, the teachers, friends and I pooled our money to pay the community space fee. I hung all the symbolic object on a grid 2 feet apart and at the same height, the students stories were broadcast in the space and a selection of Eric's portraits hung on the wall. Thanks to SCAN and Lew Zuchman who donated their space in the Bronx we were able to show the exhibition again at the SCAN Mullalay Center and all IS 151 students were able to make trips across Franz Seigal Park to see the exhibition. After two COCOONs one in Jackson, MS the other in Goutte d'Or, Paris, I wanted to come back to the IS 151 neighborhood and finish what Ms. Ortiz-Herscher and I had started 5 years before -- . In spring 2016 I began working closely with Chaney Yelverton and Danny Barber presidents of the tenant associations at Morrisania Air Rights and Jackson Houses. 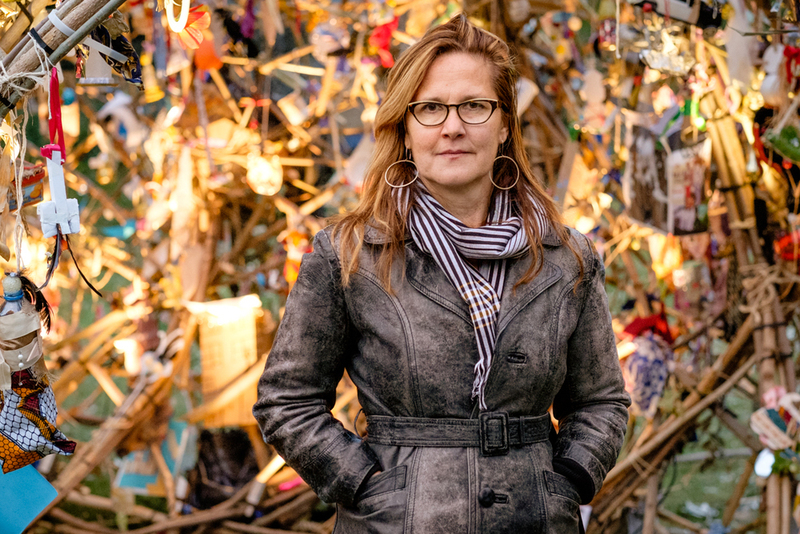 Since the spring of 2016, I've been working with a local team in partnership with the tenant associations at MARs (Chaney Yelverton, President) and Jackson (Danny Barber, President) as a resident artist in the MARs community space. I have recorded over 150 interviews with local people -- the sculpture will be built on the basketball court in spring 2018. The beginning was with the students, teachers and Ms. Ortiz-Herscher at IS 151 just across the street from MARs, Jackson and Melrose. In June I interviewed Ms. Holmes about the loss of her son. She spoke about grief, her own and community grief. She talked about sitting outside her building at Morris 1 and crying together with neighbors who had also lost children to violence. No one else can possibly understand what it's like to lose a child unless you've lost one. Ms. Holmes is a woman of incredible strength. A week later she spoke at a vigil for her 5 year old grandson, Jaheem Hunter, who was shot walking home with his Dad. Here with Luz Marie, Alejo and Rosa in front of Eric's growing photo portrait exhibition of local people @ MARs. As Danny Barber (Pres. The Jacksons) says, "COCOON is about recording history through audio and photographs"
Amazing grandparents raising amazing grand children. Hardships of becoming a permanent US resident. Good times at community barbecues on the basketball court when everybody brought a different dish and multiple nationalities were represented. Family & Neighbors supporting each other. These stories and others will be heard inside my COCOON a public space sculpture. Many thanks to Alejandro and Eric. Special thanks to Rosa for bringing refreshments and to Luz Marie for recording her beautiful story. Always awesome thanks to my hosts and partners Chaney Yelverton (Pres. MARs) and Danny Barber (Pres. The Jacksons). 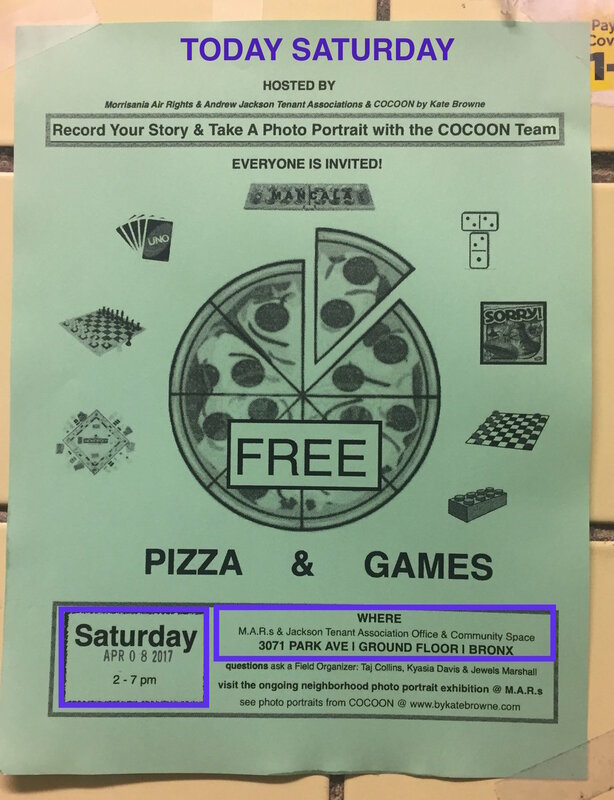 Go today Saturday — free pizza & board games, while you record your story and sit for a photo portrait with the COCOON Team — have a great time with family and friends. Hosted by COCOON, Morrisania Consolidated and Jackson Houses.